Triton's concert master, a musical genius. The little crab is also responsible for keeping an eye on Ariel to ensure her safety. Whenever she leaves the palace, he's on pins and needles. Triton's music director and Ariel's guardian. Sebastian is constantly scolding Ariel for her escapades, but only because he worries for her safety. King Triton's court composer. You could almost say he's a musical genius. Sebastian's also in charge of keeping an eye on Ariel to make sure she stays safe. Right now, he's working on a very special musical. The Royal Court Composer who is tasked by King Triton to watch over Ariel. "Ohhh. Me and my big mouth!" 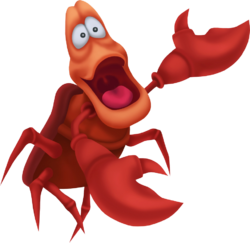 Sebastian is a hermit crab with a Jamaican accent, who is in service of King Triton in Atlantica. He appears in Kingdom Hearts, Kingdom Hearts Chain of Memories and Kingdom Hearts II. He is normally the one who tries to keep Ariel out of trouble, and keep her mind off the human world. He is also the Court Composer. When Sora arrives in Atlantica for the first time, he sees Sebastian swimming with Ariel and Flounder away from Heartless, and he teaches Sora how to swim, using Flounder as a target. When they arrive at Triton's Palace, Triton destroys the Heartless chasing them. Sebastian introduces Sora, Donald, and Goofy to King Triton. When Goofy tells Ariel that they are looking for the Keyhole, King Triton instantly interrupts and tells them there is no such thing and orders Ariel not to look for it. After Sora and party leave, Sebastian expresses his interest in the Keyhole to King Triton, only to be met with a stare. When Ursula attacks King Triton with his Trident, which Ariel gave her in exchange for transportation to another world, Sebastian and Sora arrive, but are too late to stop Ursula. Sebastian tells Sora and Ariel he wants to help them take her down. He helps them get into Ursula's Lair by pressing a button that was covered by a shipwreck that only he could reach. In the end, after Sora seals the Keyhole, Ariel tells Sora that she knows that someday she will get to other worlds, and Sebastian tells her to leave him out of it. Sebastian appears in the fake Atlantica in Castle Oblivion, albeit with a smaller role. He is looking for Ariel and the Trident as well since they both mysteriously gone missing. He later searches for them around Ursula's Lair. Sebastian is trying to use musical practice to get Ariel's mind off the surface world. When Sora and the others side with Ariel, Sebastian gets mad, not wanting them to help her find Prince Eric. Sebastian then writes "Under the Sea" song in order to persuade Ariel to stay in the ocean where she belongs. Ariel is instead saddened by the song and yearns for Sebastian to write a song about land and sea living in harmony, making Sebastian frantic over what would happen if King Triton were to find out. Sebastian goes a little bit too far when in his monologue and spills the fact that Ariel is in love with a human. King Triton happens to be right behind him, and is deeply angered by the confession. After Ariel changes into a human, Sebastian tries to help her kiss Prince Eric in time. After Ariel and Prince Eric defeat Ursula, King Triton finally allows Ariel to marry Prince Eric. Seeing this, Sebastian complies with what Ariel once said earlier in the sea, and writes "A New Day is Dawning" to show how the two worlds can join together in harmony. Afterwards, Sebastian attends Ariel and Eric's wedding. Sebastian is a small crab, despite the numerous dissimilarities between him and real crabs. His design seems to be a conglomeration of several different animals, though he does vaguely resemble a crab. His claws somewhat resemble those of a lobster, the structure of his carapace is similar to that of a turtle, and he demonstrates in The Little Mermaid that he can retract his head into it, and, most notably, he has a head and neck separate from his carapace, which goes against the body structure of all crabs, whose head and abdomen are fused together. Sebastian's salmon-colored, noseless face is vaguely humanoid, with a large mouth, large eyes, and a brow line, though he obviously does not have any hair. He even has a uvula and a pink, human tongue, other physical impossibilities for crabs. His claws and six legs are bright red, the top side of his carapace is maroon, and the underside is a dark orange color. Sebastian is very strict when it comes to following rules, especially when the rules are given by King Triton himself. He is also very loyal, albeit afraid, to his King and will do anything for him, even when asked to stalk Ariel, as he reports to him periodically on the ocean's state and Ariel's behavior. He also cares deeply about Ariel, often reminding her how bad the human world is and will try everything to stop her from getting there. In the original movie, Sebastian followed Ariel to the human world to try to save her. He can also be seen as Ariel's "conscience". He is very passionate about music and is often trying to lift up the undersea creatures' mood by singing or conducting an orchestra. He also has a tendency to let things slip out of his mouth. Sebastian originates from Disney's 1989 movie The Little Mermaid and later appears in its sequel, The Little Mermaid II: Return to the Sea. At the beginning of the film, Sebastian conducts a concert that King Triton's seven daughters are supposed to perform, as he is the "royal court composer". After Ariel, the youngest daughter, fails to show up for the concert, Sebastian and King Triton scolds her, blaming her for his humiliation. To prevent Ariel from getting herself into trouble, King Triton tasks Sebastian with following her, much to Sebastian's dissatisfaction. Sebastian complies to the order, and is horrified when Ariel saves the life of and falls in love with a human, Prince Eric. Although Sebastian tried to persuade Ariel from journeying to the surface world, his attempts were futile. After he accidentally informs King Triton about Ariel's affections to Eric in a state of panic and fear, King Triton confronts Ariel and furiously destroys her grotto filled with her personal treasures, appalling Sebastian by his actions. Guilty for his betraying Ariel, Sebastian willingly follows her when she visits Ursula for help, and later becomes an adviser in her quest to win Prince Eric's affections. During Ariel's stay at Eric's castle, Sebastian ends up in the kitchen, where he was then chased by Chief Louis throughout the rest of the film. At the film's climax, Sebastian returns to King Triton to report about Ursula's underhanded plan to steal Ariel's voice. Once Ursula was defeated, Sebastian is seen attending Ariel and Eric's wedding. There, Chief Louis continues his pursuit to cook Sebastian. Fortunately, Sebastian uses his claws to cut a rope to stop Louis, rendering him unconscious, prompting Sebastian to celebrate his victory over the relentless chef.